Do you have a blog? Has your application been rejected by Google Adsense? Are you still searching for Adsense alternatives? If Yes, then it's my promise that your search will end here. It's a reality monetizing and getting Approved for Adsense is not an easy job. After rejected by Google Adsense, webmasters start finding alternatives for Adsense. If we search for alternatives for Adsense in search engines, we find long lists of alternatives. But we all know that all the alternatives can't compete Google Adsense and mostly are just wastage of blog space and our time. I'm here writing just about only three best Ad networks which are tested by our team and high paying Adsense alternatives. Chitika pays higher CPC for blogs having good traffic. In starting it will pay you very less, after a couple of weeks, you will get better results. After Adsense Chitika is the only Ad Network paying highest CPC, that's why we also prioritize Chitika as a first Adsense alternative here. If your blog is already monetized with Adsense, still you can run Chitika Ads also with Adsense one. Apply for Chitika now and monetize your blog with Chitika Ads. BuySellAds is one of the alternatives to Google Adsense after Chitika. BuySellads is an advertisement marketplace where publishers can list their sites and advertisers can come and check the stats and directly buy your advertisement spots. Once, the advertisement is sold; you have the option to accept or reject the ad.As soon as you submit your blog to BuySellAds, it will automatically fetch up your blog stats which includes Page Rank, Alexa Rank, etc.To get approval for BuySellAds, your site should have good traffic. As soon as your site gets approved, you can set up an area on your blog for BuySellAds, and wait for advertisers to bid. BuySellads works as a middleman to process this Automatic ad buying and selling. You don’t have to pay anything to use their service but when an advertiser buys an ad from your site, Buysellads will take 25% as a commission. According to Wikipedia, Infolinks is an online advertising platform which offers advertising products for publishers, advertisers and brands. The company's products, including InFrame, InSearch, InTag and InText, were designed to overcome banner blindness. Infolinks is a Pay per click advertisement network that allows you to make money through your blog based on specific keywords. Infolinks indexes your pages and automatically add some hyperlinks in your text. Of course, since this isn’t a CPM program, it might take you a while to start earning a regular passive income through it, but it’s still an alternative to Adsense. They can pay you via Paypal, Wire Transfer, Check Western Union, ACH and Payoneer and there’s payment's thresh-hold of $50. Infolinks is great for big websites and it works in English, Spanish, French and German websites. Sign Up for Infolink now and monetize your blog with their Ads. Given alternatives for Adsense are fully tested, you can start monetizing your websites with any of them. Chitika, BuySellAds and Infolinks, all are well reputed Ad networks, and that's why I have mentioned only these three as best Adsense alternatives. I think adding lots of Adsense alternatives in a post is not ethical, as it will confuse the mind of blog owners in selecting the best one from available alternatives. 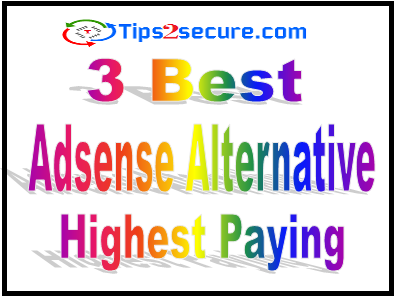 Message: I hope that you have enjoyed '3 Best Highest Paying Adsense Alternatives for Webmasters' article. However, if you want me to deliver more items, then please share my post. You can use Social Sharing Widget provided at the end of every post. After all, Sharing is Caring! Thanks for sharing your experience. It will help our readers too in selecting the best from the alternatives of Adsense.